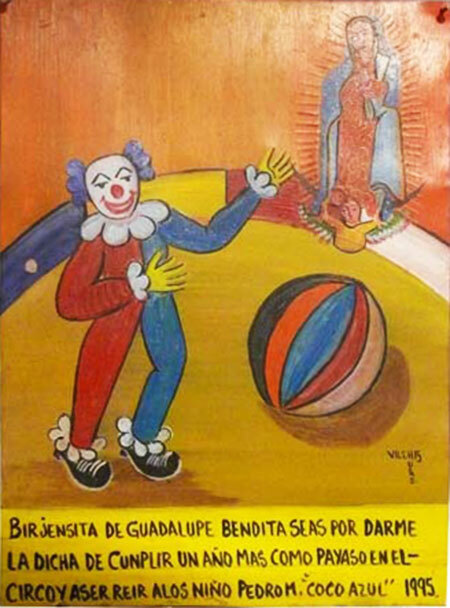 May you be blessed, Virgin of Guadalupe, for I worked one more year as a clown bringing joy to the kids. 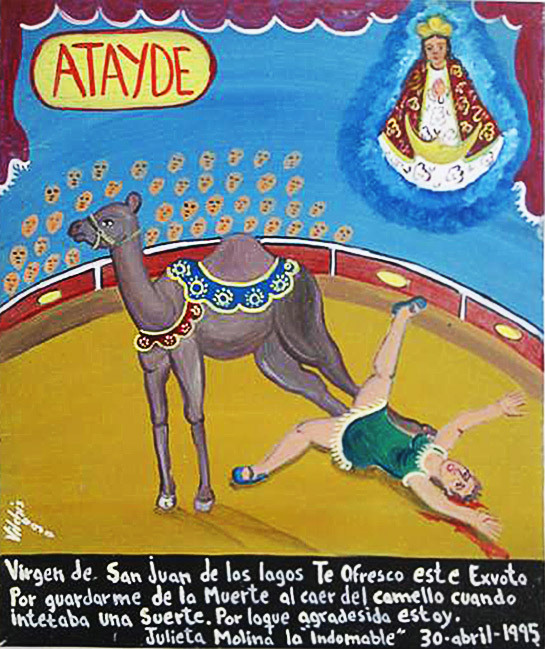 Virgin of San Juan, thank you for saving me from the death when I fell off the camel trying my luck. I thank you for that. 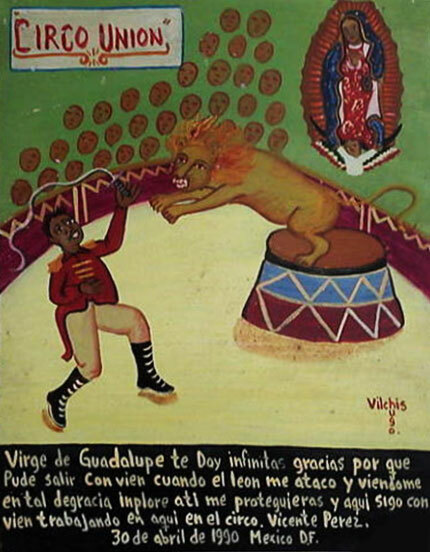 May 17, 1951, during my act at the Union circus, a furios lion attacked me. My life was in danger, and I entrusted myself to the Virgin of Guadalupe of Mexico. 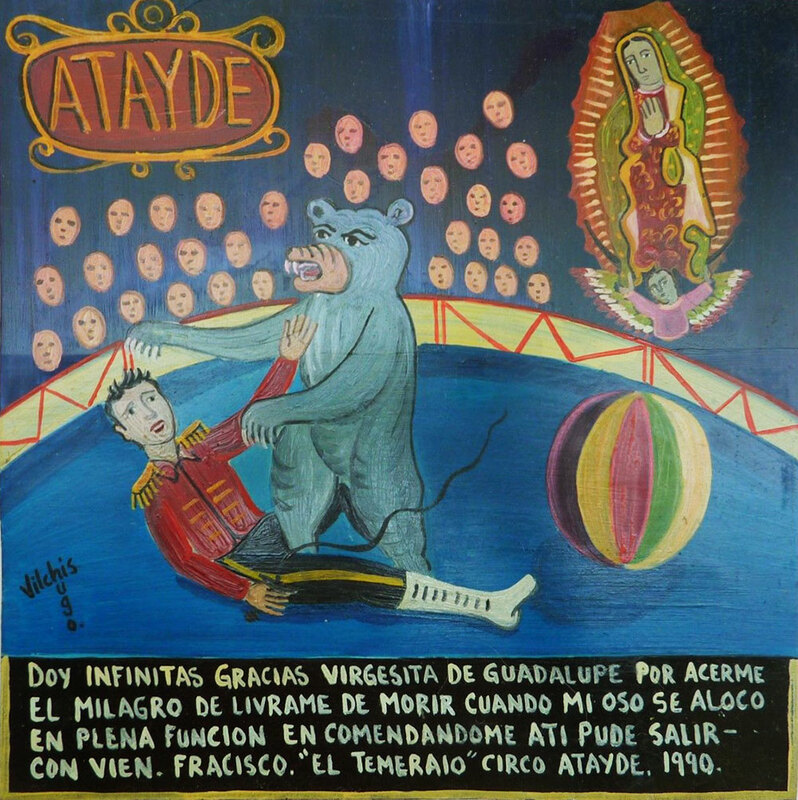 I was saved, and I bring you this retablo in gratitude. 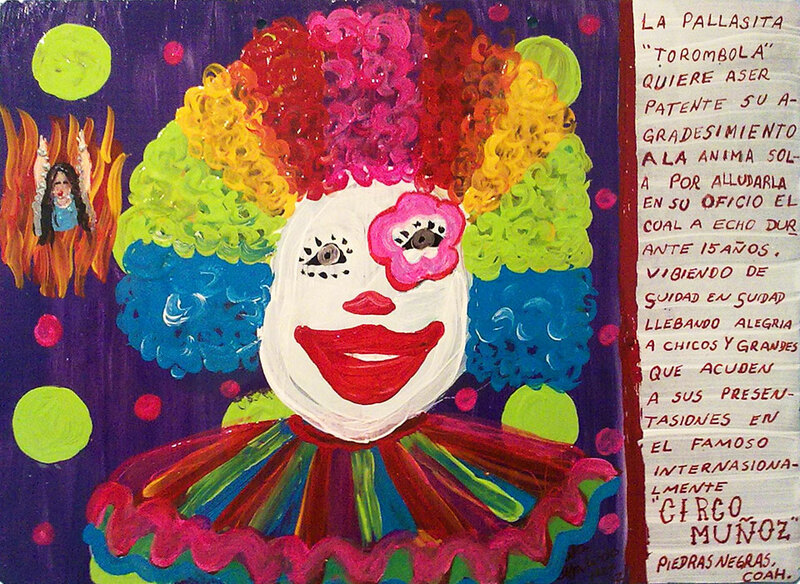 The clown Tarambola want to show his gratitude ti the Soul of the Purgatory, with this retablo, for helping him in his profession which he has dedicated 15 years to. 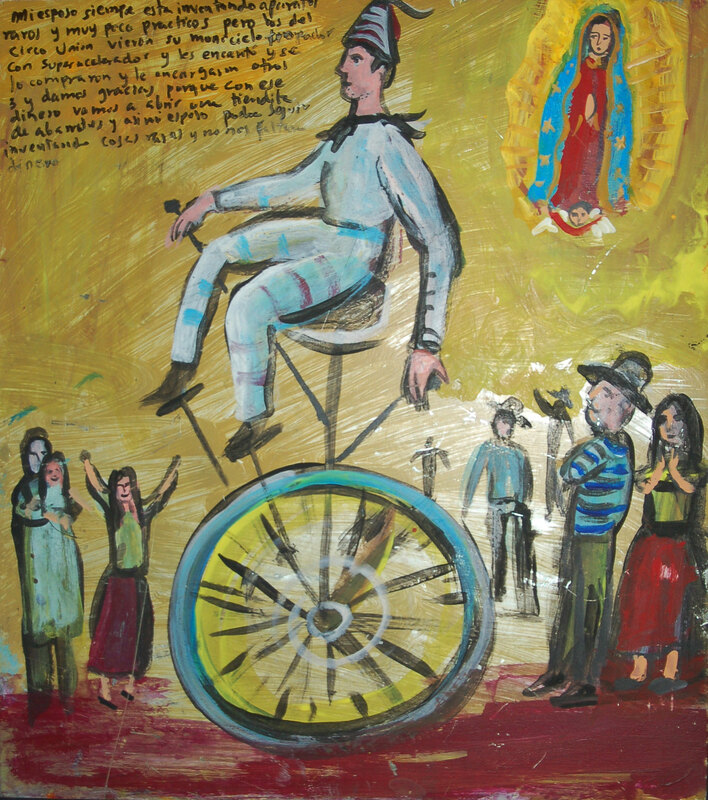 Traveling from town to town, he brings joy to the children and to the adults who come to see his act at the world famous Muñoz circus. I infinitely thank you, Virgin of Guadalupe, for the miracle of saving me from dying when my bear went crazy during the act. I entrusted myself to you and got off safely. 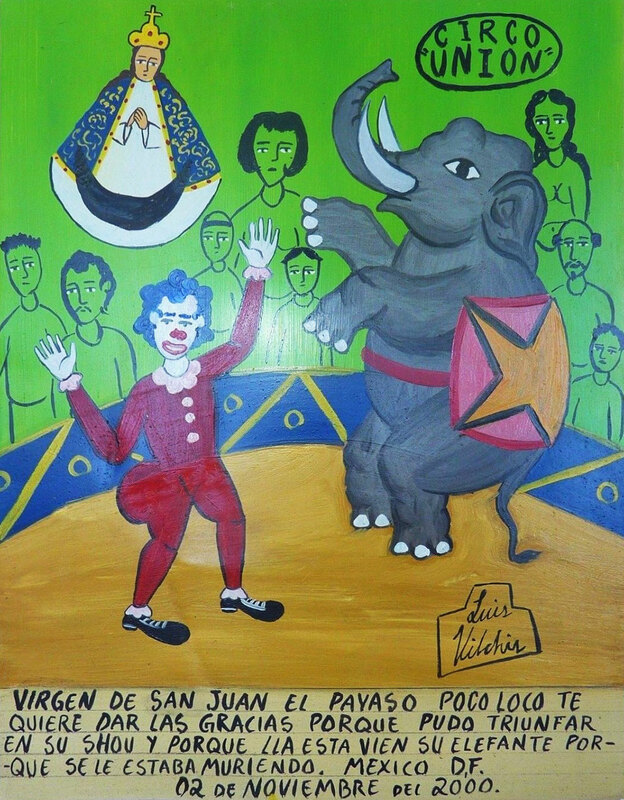 Virgin of San Juan, the clown Poco-Loco (“Slightly Crazy”) wants to thank you for the triumph of his show and because his elephant that was dying is alright now. 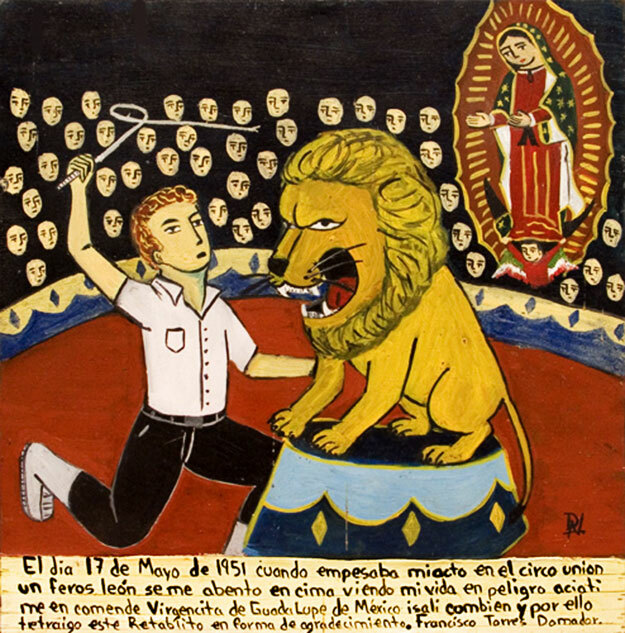 Virgin of Guadalupe, thank you because I survived after being attacked by the lion. That dangerous moment I entrusted myself to you and you protected me. Now I’m alright and keep working in the circus. The day of my debut in the circus, I felt stage fright and didn’t want to perform my trapeze act. Then I entrusted myself fervently to the Virgin of Guadalupe, and little by little my nerves got settled. 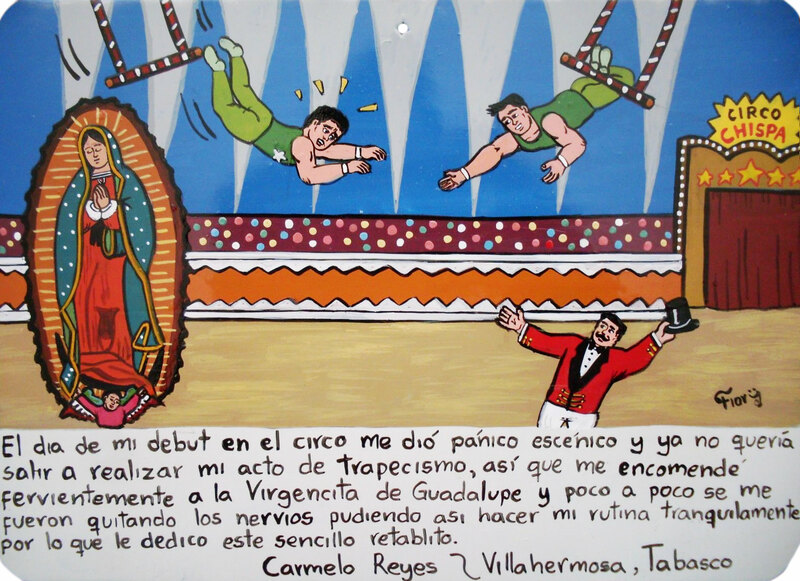 I went and did my routine with no problem for which I dedicate this humble retablo. 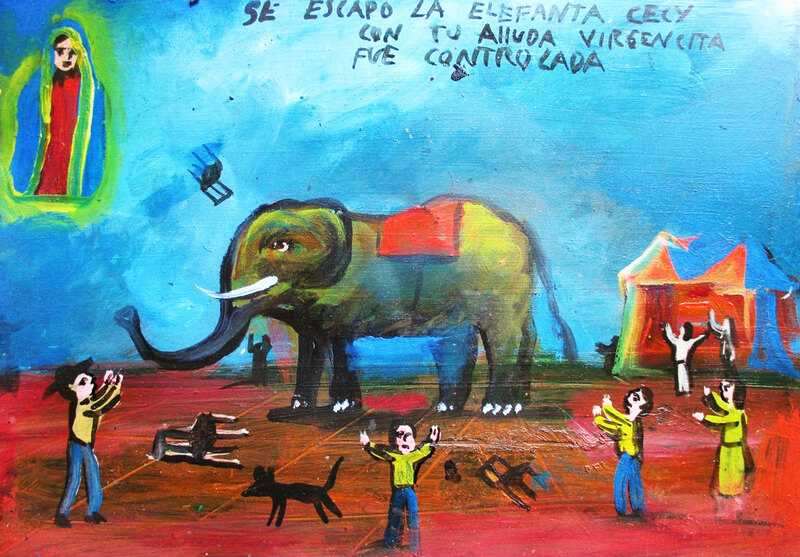 The elephant Cecy escaped but with your help, Holy Virgin, we managed to control her. 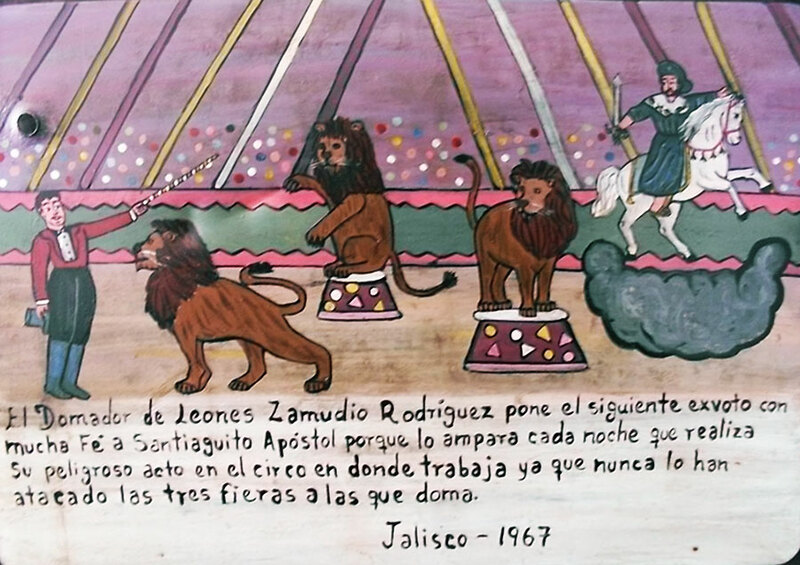 The lion tamer Zamudio Rodriguez brings the present retablo to Saint James the Apostle for protecting him every night during his act at the circus. Those three ferocious beats he tames have never attacked him so far. 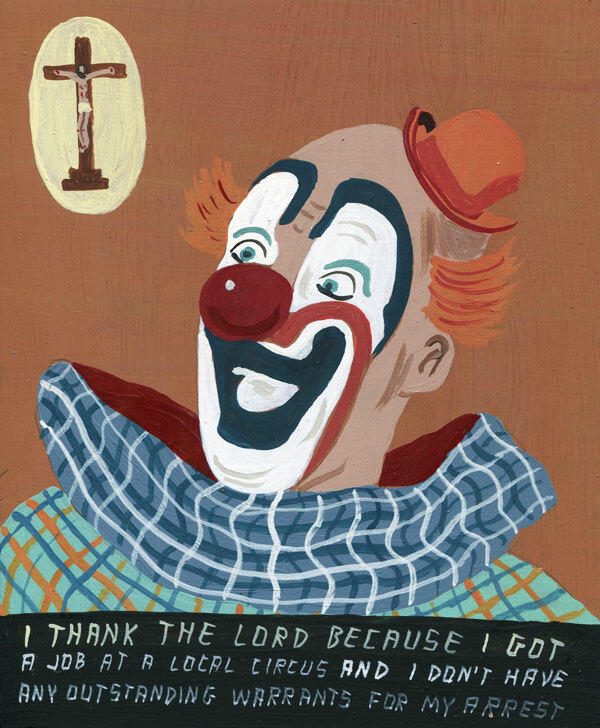 I thank the Lord because I got a job in a local circus and I don’t have any outstanding warrants for my arrest. My husband was always inventing strange devices of small practical use. But one day the circus people saw him on his monocycle with super-accelerator, and they loved it. They bought it and ordered him few more. We give thanks because with this money we could open a small groceries shop. So my husband can keep inventing his strange things, and we won’t lack money. 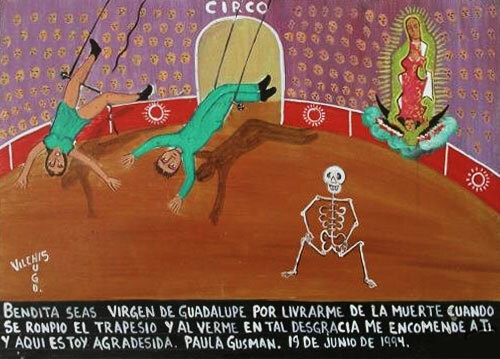 Thank you, Virgin of Guadalupe, for saving me from dying when the trapeze rope broke. In that dangerous moment I entered myself to you, and now I’m thanking you.